Terrorism, Budget Among Panetta's Challenges The biggest challenges facing Leon Panetta: how to keep America safe, and keep putting pressure on al-Qaida — all for less money. In one of his first interviews since assuming his new position, Panetta also discusses the prospects of a U.S. troop presence in Iraq beyond the end of this year, when they are scheduled to leave. Defense Secretary Leon Panetta is managing two wars in Afghanistan and Iraq, along with the fight against al-Qaida. Leon Panetta has been defense secretary for just over two months, and the challenges are already mounting. The biggest of all: figuring out how to keep America safe and keep putting pressure on al-Qaida — all for less money. NPR sat down with Panetta for one of his first interviews in his new job. We started off talking about the terrorist attacks of Sept. 11, 2001, and where the al-Qaida threat is today. Earlier this summer, Panetta said the U.S. was on the verge of "strategically defeating" the terrorist group. When asked how he'll know when that has happened — what the standard is for deciding the fight is over — he said: "I think there's never going to be a day when you can put up a mission-accomplished sign when it comes to dealing with al-Qaida." Panetta said that while Pakistan is still a major al-Qaida stronghold, the U.S. has actually shifted its focus to other countries, especially Yemen, where al-Qaida affiliates are growing. "Al-Qaida is still out there. They're in Yemen. They're in Somalia. They're in North Africa," he said. "They continue to plan attacks in this country. And I think we just have, as a result of everything we've learned over the last 10 years, probably the basic lesson is — never give up the fight. Keep the pressure on. "And if we do that, I think we'll make the country safer." Along with the fight against al-Qaida, Panetta is also managing two wars in Afghanistan and Iraq. At present, the U.S. is waiting to hear from the Iraqi government about whether Baghdad wants to keep some U.S. forces in Iraq after this year — when all U.S. troops are supposed to be out of the country. There have been reports that the U.S. would keep 3,000 troops there or even more, but Panetta said there has been no talk of numbers at this point. He said, however, he does expect in the end that the Iraqis will ask for some kind of U.S. military presence beyond 2011. "The Iraqis have made clear that they would like to discuss the possibility of, you know, of being able to have some trainers to continue to assist their forces, to be able to continue to try to make sure that al-Qaida does not return to a point where they can seriously undermine that country," he said. 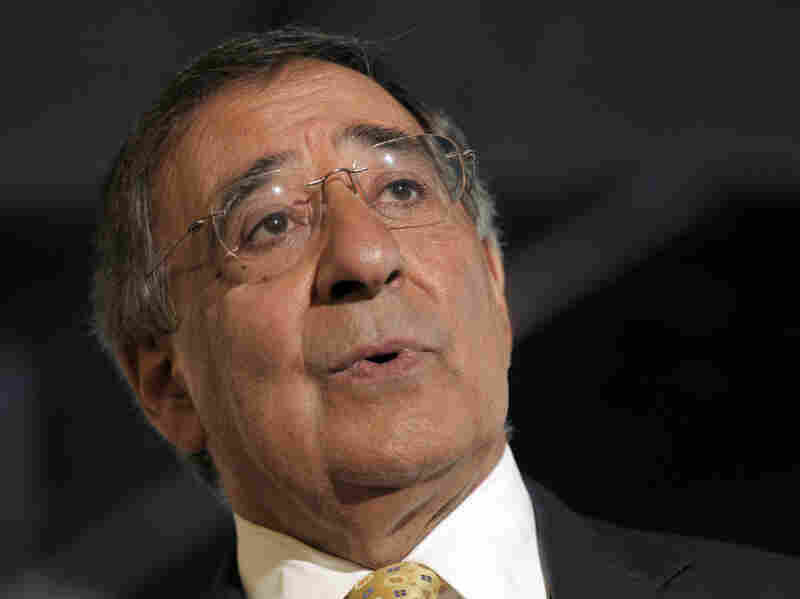 Panetta said that there has still been no official request by the Iraqis to extend the U.S. presence. But it takes a lot of money to move U.S. troops around, and the longer Iraq waits to ask, the more difficult and expensive it could be for the U.S.
Panetta is devoting much of his attention to the budget these days. The Pentagon is the middle of the huge budget battle in Washington over how to reduce the nation's deficit. Panetta said that the Defense Department has already been asked to cut $450 billion from its budget over a decade, but a congressional supercommittee may end up cutting billions more. Panetta said that would be unacceptable and dangerous. He said he thinks it's inevitable that the size of the total U.S. force is going to go down. But one thing he doesn't want to have to cut is military benefits. "As we look at those areas, as we look at health care, as we look at compensation, as we look at other areas, the one thing I don't want to do is break faith with those that have served, those that have deployed, those that have gone overseas," he said. "I just don't want them to suddenly come back and find that the benefits we promised them are going to be taken away." Members of the military pay relatively small amounts in premiums for health care compared with the civilian population. Panetta said everything is on the table when it comes to thinking about how to streamline the Defense Department's budget. And yes, he is thinking about raising health care premiums for members of the military, but not for those who are already serving. There will be more from the interview with Panetta on Morning Edition, Monday, Sept. 12.